We had agreed to meet at Hicks & McCarthy’s on Main Street in Pittsford. This was a trip down memory lane for me. I was back in my hometown in New York State, going to the “soda fountain” where kids hung out as teenagers. I could hear my father’s voice warning us not to become “drugstore cowboys,” hanging out at Hicks & McCarthy’s—a place that sold only sodas and sandwiches. Were there ever such days? The place had become a nice restaurant over the years and I was meeting Eve Strella for the first time. I have lived in California since 1966 and was back for my niece’s graduation. My sister, Robin Wilson, lives with her family in the old house now and my brother, Christopher Ritchlin, lives with his family in Canandaigua. My sister knew Eve through their mutual work as life coaches. We sat in the back, sipping sodas, and hours passed. Eve was wearing a baseball cap and looked as sharp as can be. And indeed she was. Sharp, bright, vivid, and streaming with an unquenchable light—even after months of surgery, chemotherapy, and days on end in doctor’s offices and hospitals. She had far more energy than I did during that afternoon. I was still flagging from jetlag and I don’t think I even had that kind of energy before I left California. She admitted that she had been unable to attend a luncheon earlier in the day because she hadn’t felt up to it. I felt privileged. People talk about having a positive attitude, but in Eve, this was something much larger; a quality that almost defies comprehension. She talked about the wonderful things in her life, and about her beloved partner, soon-to-be-husband, Ed Ribson. They had built an observatory—Stardust Observatory—in their backyard and she invited me to come by to see it, if I had time. We discussed cosmology and quasars and the world swelled outward around us, far far beyond Hicks & McCarthy’s. She showed me the jewelry she was making, and promised to make a pair of earrings for me. She had a shop nearby where she sold her jewelry, ceramics and wall hangings. She wrote articles and did her work as a life coach. 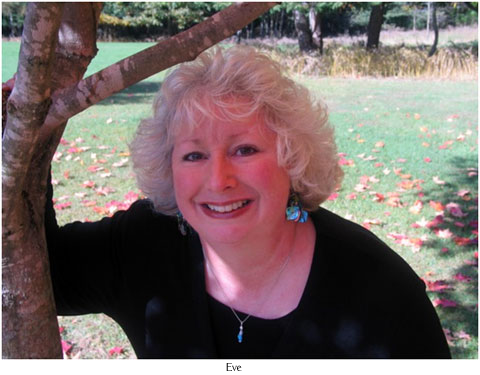 And then there was the book she was putting together of stories from cancer survivors. It became clear to me, little by little, that Eve had stage 4, terminal cancer and was not in denial of it at all. “I just don’t intend to be stamped with an expiration date,” she said. 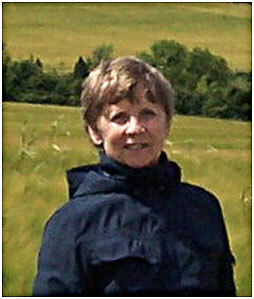 She lived each day as a special and exceptional experience. 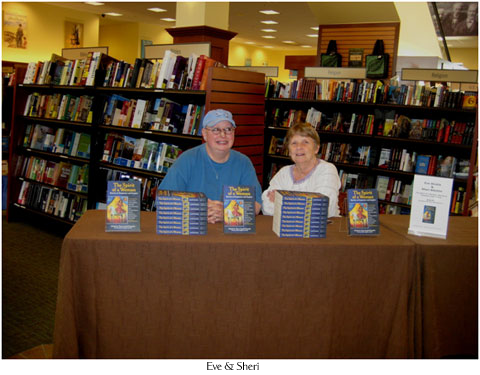 The purpose of our meeting, beyond getting to know one another, was to plan two book-signings in Rochester for Terry Laszlo-Gopadze’s book The Spirit of a Woman. Since both of us had stories in it, we decided to do this together and she had made the arrangements. I had worked as an editor on the book and remembered very well when Terry sent me Eve’s story to consider for inclusion in it. I had been deeply moved and impressed by the story so I answered with a resounding,” Yes”. I really wanted to meet the woman who had written that story when I discovered that she lived in my hometown back east. Eve’s story in The Spirit of a Woman was not about her cancer. That came later. It was about the death of her husband, of twenty-two years, which came upon her unexpectedly when he entered the hospital for heart surgery and died that night. It was a searing experience, and Eve wrote the story in a way that any woman who has been through it can identify with. It is a story that “empowers and inspires”—the subtitle of Terry’s book. The interview with Eve in Rochester Woman Magazine was indeed something else to be proud of. I just tried to follow the link again and found that the article is no longer up, so I wrote to the publisher, Kelly Breuer, and she sent this reply. You see how she touched people. I will include that article below when it arrives. In March of this year, I heard from Eve again, asking me to take a look at the press release for her cancer survivors book. My jaw dropped. 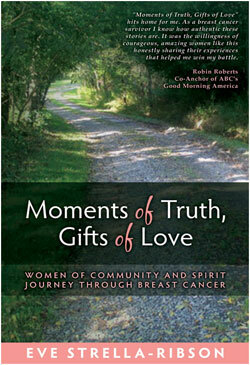 The cover was beautiful and carried a comment by Robin Roberts, co-anchor of “Good Morning America.” The title was Moments of Truth, Gifts of Love: Women of Community and Spirit Journey Through Breast Cancer. Now keep in mind that all during this period, this was a person with Stage 4, terminal, cancer. By the end of May this year, she was back at Barnes & Noble in Rochester for a book-signing for her new book. The spirit has no expiration date. Long live that fine spirit. The following poem was very important to Eve because David Whyte had written it for a friend who was dying of cancer. It speaks of death as the beginning of a journey instead of a departure. The poem resonates with Eve’s indomitable spirit and courage and it gives us all hope for our own journeys.